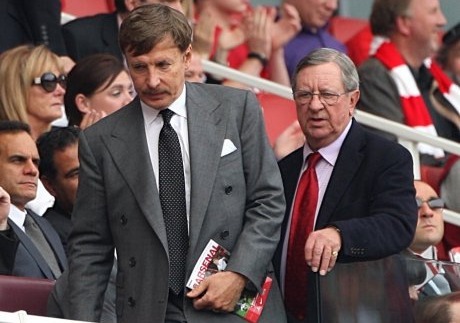 Stan Kroenke has launched a bid to takeover Arsenal Football Club. The American will offer £11,750 for each of Danny Fizsman and Lady Nina Bracewell-Smith's stake within Arsenal Holdings PLC, the company which controls the interests of Arsenal FC. "We are excited about the opportunity to increase our involvement with and commitment to Arsenal. Arsenal is a fantastic Club with a special history and tradition and a wonderful manager in Arsene Wenger. We intend to build on this rich heritage and take the Club to new success. I am delighted that Peter Hill-Wood has agreed to support us by continuing as Chairman. "We especially wish to acknowledge and thank the Board, Danny Fiszman and the Fiszman family as well as Lady Nina Bracewell-Smith and her family for the confidence they have had in me over the past years and in allowing us to move forward in this more prominent role." "The Board of Directors and I consider it a key responsibility to protect the ethos and spirit of the Club. Mr Kroenke, although relatively new to Arsenal, has shown himself to be a man who values and respects the history and traditions of this very special Club that we cherish. We are confident that he will be a safe custodian of its future. "At this time of transition I would like to pay particular tribute to Danny Fiszman for his immense contribution. Danny's vision and drive led the relocation to our new stadium, an historic move which will benefit the Club and its many passionate fans long into the future. "I would like to pay tribute to the important and long-standing role that the Bracewell-Smith family have played in Arsenal's history. The family have been staunch supporters of the Club for over 70 years and the Club is significantly indebted to them for the role that they have played in its development and success. We will be considering appropriate ways to mark this long and valued contribution." "I have worked with Stan Kroenke at board meetings over the past couple of years and I believe he has the best interests of Arsenal at heart. He understands the Club's heritage and traditions and our ambition to run the Club in a way which protects our long term future."